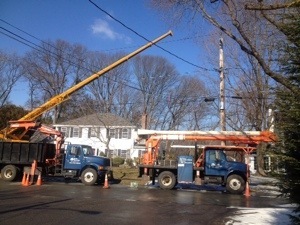 Removal of numerous large Red Oak trees in Wellesley, MA utilizing a 65 Ton crane to reach over the house into the backyard. Many of us by now have seen the destructive power of winter weather on roofs and trees. It doesn’t take too much ice to add a substantial amount of extra weight to tree limbs and branches. Sometimes the extra load is more than the tree or branch can stand, and whole branches of a mature tree can come down, or even split the tree in two. Bark Busters can help with fallen branches of broken trees. 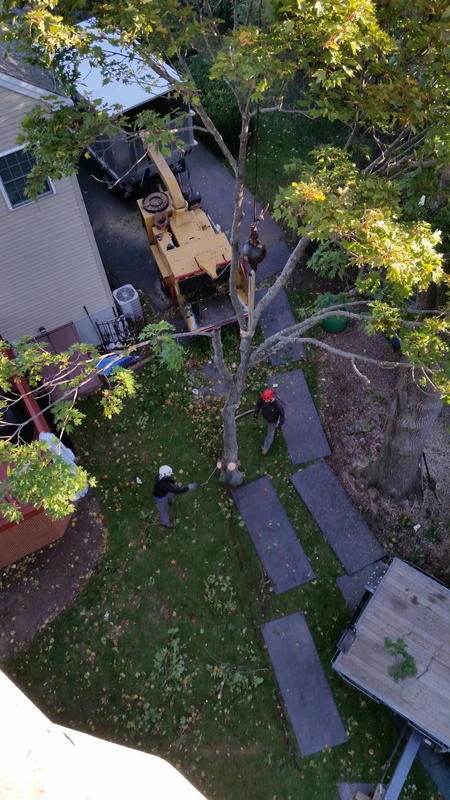 While it may be too late to save a tree that has been shattered by ice and snow, we can safely remove fallen tree branches and tree stumps and dispose of them in an environmentally friendly way. You should always call a licensed arborist like Bark Busters to remove a fallen tree. Trees are extremely heavy to begin with, and even more so when coated in ice. Never attempt to move a fallen tree when there is a risk of affecting power lines with any movement. 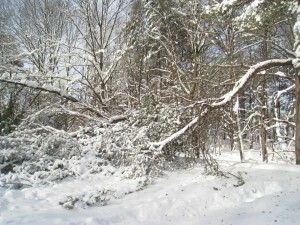 Trees that are on or near power/utility lines should be moved by utility companies. Call to report any such trees to your local utility provider. If your trees have so far made it through the season, but you are concerned they might be at risk, we can help with tree cabling and tree bracing solutions to stabilize the tree for years to come, preserving the value and character of your landscape. Call us for your free estimate today.